Home Discussion Theory What are public goods? What are public goods? They are goods that cannot be wholly provided by the market. An example is this ferry, which goes summer and winter, day and night, regardless of whether anyone turns up to travel on it. Assuming people had to pay at the point of use, how could this be charged for? By dividing the cost amongst the number of users? By having different charges at different times? By having a fixed set of charges? All but the first option involve cross-subsidisation. Is that fair? The Swedish government long ago decided that such ferries should operate as a public good. 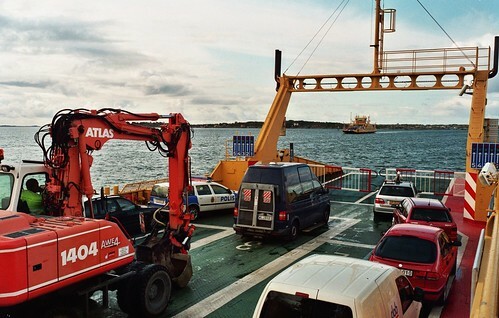 The highways agency Vägverket which runs the ferry makes no charge. Which means that they have to be paid for out of taxation. Now there's the rub. Sweden spends the second highest proportion of GNP in the public sector of any country in the world. There is no shame in that. There is no magic number which is the right division of the GNP between private and public sectors. The two work together. But in this case, who benefits? Ultimately, it is the people who own land on the islands which are served by the ferries. If the ferries stopped running, then the islands would be depopulated and land values would collapse. This is a good example of how external value is created and sustained. We would argue that it is fairer to pay for such services out of a tax on the rental value of land rather than from taxes which fall on production, which in Sweden have resulted in absurdly high labour costs and in the long run are not sustainable. In Britain, we get a similar thing with the railways, but the concept of external value is not widely understood, which gives rise to the idea that railways are subsidised. Like all infrastructure, railways sustain land values. The land value in a place like Brighton is largely due to the train service and would drop like a stone if present services went back to, say, what they were 50 years ago. New railways such as the Jubilee Line Extension have resulted in a land value uplift of up to three times the construction cost. The new high speed commuter service to Folkestone will have an impact on land values once the recession is over. The Metropolitan Line was partly financed through land purchase, followed by development after the railway was built. That was the origin of "Metroland." Railway operators can of course make charges at the point of use and receive revenue from fares in this way. But farebox revenue can usually only cover, at most, running costs. It will not pay for new infrastructure or major improvements, which usually have to be paid for out of taxation. The operators, whether private or public, have no means of gaining access to this external revenue stream which they generate. "Subsidy" from general taxation is just a way of making up a bit of the loss. In the present recession, costs of construction and materials have slumped. It would be a perfect time to absorb spare capacity in the construction industry by improving infrastructure. The government should ask Network Rail to submit a list of projects for electrification, doubling of single lines and reopening of closed lines, and told to get on with the worthwhile ones. The cost can be recovered through a land value tax, which would capture the enhanced value which would be created. One of the benefits of doing this would be the the external value could be quantified. It would then be possible to establish what was worth paying for, what was not, and how much should be paid. It could even, in time, be used to exert pressure to squeeze out wasteful practices. We do not support, for example, the use of expensive consultants and contractors for activities which were being carried out at lower cost in-house in British Rail times. It is a widespread view, but consider this. The journey from London to Brighton at present takes about 50 minutes by train. If a few billion pounds were spent - and it would be taxpayers' money, the journey time could be reduced to 30 minutes. If the fares stayed the same, then land values would go up to what they are in other desirable parts of London 30 minutes from the centre. This would be reflected in shop and residential rentals and house prices. The overwhelming majority of people in the city would appreciate the improved service. Those who did not would cash in handsomely and move. But the Treasury who had borne the cost would get nothing. Consequently the Treasury is always reluctant to pay for schemes like this, or Crossrail. People want improvements but will not pay for them, because there is so little sense of the value of the public good and the public realm in Britain. Why that should be so is an interesting question but it helps to explain the poor quality of so much of Britain's infrastructure, especially its public transport.